To Cite: Sheikh Fathollahi M, Torkashvand F, Najmeddin H, Rezaeian M. Predictors of One-Year Retention in Methadone Maintenance Treatment (MMT) in Iran, Rafsanjan, Int J High Risk Behav Addict. 2016 ; 5(3):e29121. doi: 10.5812/ijhrba.29121. Background: Retention in treatment is a key factor to the success of methadone maintenance treatment (MMT) and considered an important measure in evaluation of treatment effectiveness. Objectives: This study aimed to investigate the retention rate and predictors of retention in MMT in Rafsanjan. Patients and Methods: This was a historical cohort study. A total of 1396 patients admitted between March 2011 and March 2012 in 16 MMT clinics (13 private and 3 state clinics) in Rafsanjan, entered the study and their retention rate was examined for one year. The patients’ data abstracted from their medical records using checklists and collected by clinics’ staff. Data analyses were performed using SPSS 15.0 and SAS 9.1. Kaplan-Meier method and Cox proportional hazards model were used to determine the retention rate and identify predictors of retention, respectively. Results: The mean age of 1396 patients was 37.65 ± 10.77 years and most patients were men (93.8%). The mean and median of retention duration were 193.22 ± 3.83 and 153 ± 9.54 days, respectively. Three-month and one-year retention rates were 66.0% and 34.4%, respectively. Predictor variables of one-year retention in Cox proportional hazards model were high methadone dosage, polysubstance abuse and treatment under state clinics. Conclusions: In this study, retention rate was lower compared to previous studies from other countries. The results suggested that program related factors are better predictors of retention than individual related ones. Methadone maintenance treatment (MMT) is one of the most effective treatment methods in opioid dependence worldwide (1-3). Retention in treatment is a key factor for a successful MMT and considered critical in evaluation of treatment effectiveness (4-8). Longer retention in treatment is the most important factor and there have been positive relationships with positive outcomes, such as reducing risk of relapse to drug use and high-risk behaviours (9-12). Drug users who remain in the treatment for a longer time have lower mortality, function better in society and have lower risk of contracting HIV than those who leave the treatment (12-15). Previous studies have shown that retention rate in MMT is influenced by three factors of individual, program and social related factors. Individual related factors included age (16-18), gender (19, 20), race (21, 22), opiates use history (23, 24), HIV (25, 26), criminal history (18, 27) and mental health status. Program related factors include the methadone dosage (17, 27, 28), treatment service accessibility such as services cost and distance to therapeutic center (20, 29) and social related factors including family (30), society (31) and peers’ support (28). One primary goal of MMT was to maintain patients on treatment as long as they achieve positive outcomes of treatment (2). Therefore, identification of factors associated with retention is essential. The present study was performed to investigate retention rate and predictor variables of retention in MMT among drug users in Rafsanjan. This was a historical cohort study. A total of 1396 patients admitted between March 2011 and March 2012 in 16 MMT clinics (13 private and 3 state clinics) in Rafsanjan, entered the study and their retention rate was examined for one year. The patients’ data abstracted from their medical records using checklists and collected by clinics’ staff. The checklists included demographic information, criminal history, pattern of drug use and the average dosage of daily methadone use during treatment. Retention duration in MMT was the outcome variable. Retention was defined by the number of days a patient remained in MMT and calculated from the first MMT entry up to the date patients dropped out of treatment. Predictor variables of retention were examined in two groups of individual and program related factors. Individual related factors included age, gender, marital status, education, employment, physical and mental illness history, addiction treatment history, polysubstance abuse, opiates use duration and prison history. Polysubstance abuse is defined as history of using two or more groups of addictive substances prior to treatment. Program related factors included type of clinic (private or state clinics), average dosage of methadone and experience of clinic providing methadone treatment. Clinic experience was defined as duration that clinic had provided methadone treatment. Results presented as mean ± SD (standard deviation) for numeric variables and summarized by absolute frequencies and percentages for categorical variables. A multivariable Cox proportional hazards model with forward variable selection process for exploring variables associated with retention in methadone treatment was constructed. Variables incorporated into the multivariable model were age, gender, marital status, education, employment, physical and mental illness history, previous drug treatment, polysubstance abuse, duration of opioid dependence, prison history, type of clinic (private or state clinics), average dosage of methadone and experience of clinic providing methadone treatment. The associations were presented as hazard ratios (HRs) with 95% confidence intervals (CIs). The overall fit of the final model was checked by Cox-Snell residuals and graphical inspections were also performed to assess any departures from proportionality. To further examine, we checked the proportional hazards assumption by adding a time-dependent covariate adjusted for other covariates (32). No statistically significant violation of the assumption of proportionality was detected in multivariable analysis. Retention rate was also estimated using the Kaplan-Meier method, the standard estimator of the survival function, as univariable analyses. For statistical analysis, statistical software SPSS version 15.0 for windows (SPSS Inc., Chicago, IL) and statistical package SAS version 9.1 for windows (SAS Institute Inc., Cary, NC, USA) were used. All p-values were 2-tailed, with statistical significance defined by P ≤ 0.05. The mean age of 1396 patients was 37.65 ± 10.77 years (ranged from 14 to 80 years). Patients' socio-demographic characteristics are detailed in Table 1. Most patients (89.6%) were treated in private clinics. The clinics experience was 1 - 5 years with an average of 1.91 ± 1.95 years. The mean daily dose for all patients was 57.06 ± 18.04 mg/day. The mean age at start of cigarette and opiate abuse were 21.00 ± 7.23 and 22.95 ± 8.80 years, respectively. The mean duration of opiates use was 12.17 ± 8.06 years in life time. Opium, “Shireh” (opium juice) and heroin were the common drugs during lifetime and past 30 days prior to treatment, respectively. Oral route was the most common route of administration for using opium and “Shireh” and smoking for using heroin (Table 2). The mean and median of retention duration were 193.22 ± 3.83 and 153 ± 9.54 days, respectively. The cumulative retention rate at 3, 6 and 12 months were 66.0%, 47.3% and 34.4%, respectively. Figure 1 depicts the cumulative retention rates for study sample. Cumulative retention in treatment decreased over time and over 50% of patients dropped out of treatment before 6 months and about one third of patients remained in treatment to complete the 365-day period. In this study, predictive factors of one-year retention were examined in two groups including individual and program factors. The predictors for retention rate in the Cox proportional hazards model were high methadone dosage, polysubstance abuse and treatment under state clinics (Table 3). The results indicated that one third of the participants (34.4%) had one-year retention. There are a limited number of studies examining retention in MMT in Iran. In a multi-center study (Shiraz, Ardebil, Ilam and Semnan), three and six-month retention rates were 50% and 22.7%, respectively (29). In the current study, one-year retention rate was lower than those from studies in Cambodia 70.7% (33), Guizhou 57.4% (34), Israel 74.4% (35), Colombia 52% (36) and Ireland 61% (37). The lower retention rate in the current study may be explained by possible differences in socio-economic and political context, clinic policy, organization of service and drug use conditions. Results of Cox proportional hazards model indicated that one-year retention was predicted by high methadone dosage, polysubstance abuse and treatment under state clinics. Higher doses of methadone were associated with longer retention in treatment, which is consistent with prior investigations (27, 28, 38). A review of 44 methadone programs found that the dose level was the single most important factor affecting retention in treatment (39). Methadone dose is a critical factor in retaining patients in treatment (40). Higher doses were consistently shown to encourage treatment retention and reductions in illicit drug use in MMT (41). Methadone dosage should be based on patient’s individual needs and there is no single best dose for all patients. Researchers suggest that responsive and flexible individualized dosing is associated with better retention in MMT (38, 42). 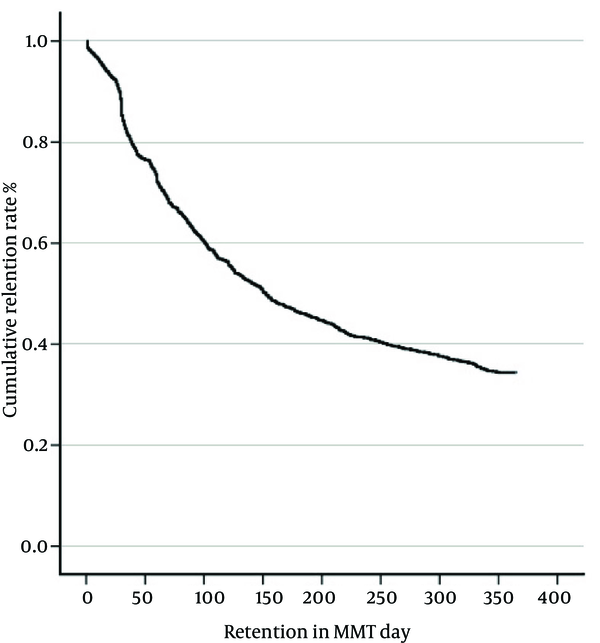 The strongest retention predictor was treatment under state clinics (Marginal clinics). The likelihood of remaining in treatment within one-year duration was higher for patients in state clinic compared to those of private clinic. There are possible explanations for this finding. One explanation may be related to costs of delivering treatment. Monthly treatment cost in private clinics is nearly three-fold as much as state clinics. Some studies found that treatment fee is associated with retention in MMT and fee-for-service methadone has poorer retention rates than free treatment (28, 43). Another explanation is that the state clinics’ clients are patients with low economical status who cannot afford opiates costs and these patients are forced to remain more in treatment and have more retention, not because of medical motivation but due to financial inability in affording opiates. Retention rates were further predicted by polysubstance abuse. This study revealed that patients who abused polysubstances are more likely to remain in treatment at one year compared to those who abused a single substance before entering MMT. This finding is inconsistent with some other studies (18, 44). Another study showed that patients who abuse a single substance (only opium) were less motivated for treatment and as early leaving treatment (45). A prior study indicated that an important predictor of early dropout was lower motivation for treatment (46). Finally, although the study sample was large, it may not be representative of all MMT retention in different regions of Iran. Therefore, more studies are needed from different parts of the country. In summary, the present study showed that retention rate is lower compared to studies in other countries. The results showed that program related factors are better predictors of retention than individual related factors. Given the importance of program related factors on retention, policies and practices that influence retention such as reducing treatment costs and prescribing appropriate methadone dosage, may yield better outcomes. This research was supported by Rafsanjan University of Medical Sciences (RUMS). The authors wish to thank the staff of MMT clinics of Rafsanjan. Authors’ Contribution: Study concept and design: Rezaeian, Sheikh Fathollahi, Torkashvand and Najmeddin; analysis and interpretation of data: Rezaeian, Torkashvand and Sheikh Fathollahi; drafting of the manuscript: Torkashvand; critical revision of the manuscript for important intellectual content: Sheikh Fathollahi, Rezaeian and Najmeddin; statistical analysis: Sheikh Fathollahi and Torkashvand.